Armor materials play an extremely significant role in the protection of an individual, an object or a vehicle, among others. Armor materials are used to make a variety of protective shields for soldiers, vehicles and other objects during combat. These are also used in case of harsh environmental conditons for first responders to be able to help with relief work with sufficient protection for themselves. The unfortunate growing instances of terrorism across the globe is a major driver for this market. Protective gear for law enforcement and military personnel is of paramount importance. A large amount of research efforts are underway to develop higher quality armor materials. This research is also being done by major players in the market in collaboration with some of the top universities across the globe. One of the main objective is to develop materials that are lighter and thinner while offering superior protection. Technological advancements stemming from such research efforts is one of the main factors driving the growth of this market. Nanotechnology is also aiding the development of new armor materials that were not possible earlier. 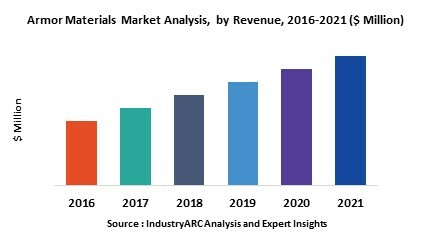 The armor materials markets is expected to grow significantly across all geographies. Given that terrorism is a global problem ensures that the demand for high quality armor is omnipresent. However, developing economies in Asia Pacific such as India and China are focussing on modernization of their military capabilities and hence the demand from these regions is expected to be on the higher end till the end of the forecast period. North America, followed closely by Europe, accounts for the largest share of the global armor materials market.